The moment this reviewer saw the trailer for this Julie Taymor-directed musical, he knew he must get on his hands on the rock-a** soundtrack album. Featuring Beatles songs which defined the 1960s when the film is set in, this disc is a must-listen for any Beatles fan, and anyone who is ready for an out-of-this-world musical journey. The 16 songs on this 52-minute soundtrack are rearrangements of familiar Beatles tunes performed by a very talented cast from the movie. These songs may probably work better with a context after you have watched the film, but when played independently, they leave a lasting impression too. 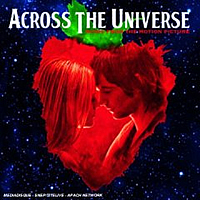 Main leads Jim Sturgess and Evan Rachel Wood are surprisingly competent singers – listen out for Sturgess’ soulful performance on tracks like “All My Loving” and “Something” (watch out, James Blunt! ), while Wood blew us away with her breathily soothing takes on favorites like “It Won’t Be Long” and “Blackbird”. Elsewhere, Asian singing star Teresa Carpio’s daughter T.V. Carpio performs a very pleasant rendition of “I Want To Hold Your Hand”, Carol Woods breaks any die-hard romantic’s hearts with her “Let It Be”, and Irish band U2’s lead singer Bono rocks it out on “I Am The Walrus”. Mexican/American actress Salma Hayek also contributes her vocals on the soft rock tune “Happiness Is a Warm Gun” with British actor Joe Anderson. Director Taymore had worked with Hayek on the autobiographical film Frida (2002) and Elliot Goldenthal, who happens to be Taymore’s husband and a composer and song producer on this album. You can almost feel the spot-on chemistry here. Aptly chosen songs which refer to the characters played by Sturgess and Wood (Jude and Lucy respectively) in the film are also included in this soundtrack - Anderson’s wonderful “Hey Jude” and Bono’s captivating “Lucy in the Sky With Diamonds”. Out there somewhere, there is a deluxe two-disc version of the soundtrack. Fans definitely need not go across the universe to hunt down to complete the visionary musical journey.